Breaking the stigma surrounding mental health requires more than just awareness, it requires empathy. Even if you’ve not experienced anxiety on a clinical level, most are familiar with feeling anxious – even performers. 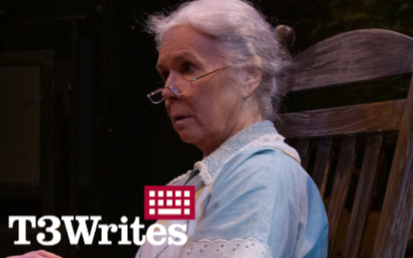 First preview means that there is a great deal of anxious energy floating around this theatre, so I caught up with Madison Calhoun, who plays Molly in The Manufactured Myth of Eveline Flynn, to talk a little about acting and anxiety. If you’re reading this, chances are you suffer from glossophobia. Glossophobia is the fancy medical term for the fear of public speaking. According to The National Social Anxiety Center, about 73% of Americans suffer from this crippling fear. The smart science-y people tell us that our fear of public speaking comes from a deeper-rooted fear of judgment and rejection. So, what about performers, the people who get up to speak or sing in front of an audience night after night? I wish I could say we are immune to this kind of fear, but I would just be lying to you. Just as you might be afraid to put yourself on the line at a work presentation or while teaching in front of a classroom, actors have to make ourselves vulnerable every time we perform. While the words we speak may not be our own, the nature of our work requires us to let us down our guards and— pardon the melodrama— bare our souls to anyone watching. From the moment performers begin training we are taught to critique and analyze ourselves, empathize with a character, feel and display an elaborate range of emotions, and suspend reality – all while maintaining enough self-awareness to hit every mark and remember every note. I think we all understand the term “tortured artist,” right? It’s not easy. Yet we’re required to make it look as though we have all the confidence in the world. So how do we manage it? We all have different tricks, but I like to practice deep breathing, power posing, and trust myself to know that I’ve worked hard, know the material, have a deep connection to my role, and ultimately can do my job well. Sometimes I do a great job of overcoming, or at least hiding, my insecurity. Sometimes my mind and body betray me. I have a diagnosed anxiety disorder as well as a physical tremor, two factors of my reality that can make my job harder. But we all have obstacles that we must accept and choose to overcome daily. You’re probably wondering why we put ourselves through it— the angst, the nerves, the fear. Well I can’t speak for everyone, but I find that it’s worth it every time. The second I hear a laugh, a gasp, a tense silence from the audience, I am invigorated with the feeling of connection. I can get up in front of a group of people and make them feel something! That’s a special opportunity, and I wouldn’t trade it for the world. So next time you’re watching an actor, dancer, performance artist, singer, or anyone else wearing their heart on their sleeve for an audience’s enjoyment, remember that they’re just like you! Chances are they have some butterflies, but only because they want to bring you a great performance. And hey, maybe you’ll be inspired to overcome your fears, too!